Nice article Simone! As I was reading I could just imagine being in your shoes and trying so desperately hard to clamp down on the natural fangirl trying to break free! So glad for you, even though Im also sooo jealous! But, it couldnt have happened to a lovlier lady! Wow, what a lovely report of your experiences watching Richard Armitage onstage! I’m so happy that he was able to perform in a comedy role again. My first time seeing RA onscreen was in The Vicar of Dibley and I immediately stood up and took notice and thought he was a comedic actor. I’m thrilled you were able to meet him and I thank you for sharing your memories of the evening. Wow, Simone, thanks so much for sharing this lovely adventure with us all! A beautiful, down-to-earth, gracious guy just as I always thought he would be. And I am thrilled he got to play a fun comedic role. RA was so delightful in the Vicar of Dibley and while he does angst and torment very, very well, how nice to do some lighter fare for a change! Wonderful report. Thanks so much. Thank you for treating ‘our man’ with such dignity. There are a fair few of us that love and adore his work, but my fear is that some people may over step the boundary and inappropriately hound the man. It was a fantastic night and may you always have sweet memories of meeting him. Thank you for sharing this blog with us all. What a fantastic night, one to remember for a long time. Thank you for sharing that wonderful experience with us. The play sounds like it was fabulous too. How do you manage to track them down !!!! What a delightful read. Thank you so much for sharing with us. Thank you so much for putting your blog so quickly. You must have had a truly wonderful night. Great to hear that RA had a chance to shine at comedy once more. Simone, Thank you for your generous account and lovely tweets! Thank God for sisters! I had mine on me too for awhile before I came round. It’s when I visited home and was told I couldn’t leave without watching N&S that I came round to the Armitage effect. But this was not all of your night; won’t there be a post about Dan Stevens who remembered you? Most importantlyI am so Happy Mr. Armitage got to have a GOOD laugh!! Fantastic article, green with envy at seeing RA play on stage, and then next to him on the bus….dream come true. And I just knew he would be down to earth, charming and any other adjective one can think of. Love all his work, and I guarantee that he will be a huge success in The Hobbits. My only fear is that he will be whisked off to Hollywood and we will lose him to them over the pond…. thanks again for your experience. Forgot to add; to see Mr. A actually do some dancemoves!! What a dream!! Couldn’t have happened to a nicer person than you Simone. Regular theatre goers do get rewards. I’m still swooning for you. Did you sleep last night? Dream of RA perchance? Thrilled and happy for you. You must still be on a natural high. Pinching yourself? Just look at the photograph. Thank you for sharing this special night!! Im’ so thrilled for him doign so well, and thrilled you had such a special night! Thank you so much for this wonderful review of RA’s play….I would have given a great deal to have been able to see it, but your summary is the next best thing! I’m thrilled that you had the chance to meet him as well and that he was as many of us believe, charming and generous. Congratulations on experiencing the “Armitage Effect” first-hand! Thank you so very much Simone for sharing this wonderful experience with all the world, and for sharing your tweets last night as it happened! What a magical experience for you. Whenever I see him in interviews I always love his sense of humor so I’m glad he did get to show his comedy and dancing side last night. How wonderful to know from you,though I never had any doubt, that Richard Armitage is beautiful inside and out. Oh I’ve just turned green with envy! You lucky devil! One day I will manage to get out of my pit and meet the gorgeous one. Soon, very soon, I promise! Simone, thank you so much for sharing this lovely account with us. I am very happy that he was as lovely and gracious a person as one could hope to meet. It is wonderful when the beauty outside is matched by the beauty inside. I am happy he had an opportunity to do something a little lighter too. I am sure you will treasure this experience. Lucky, lucky girl! You do realise that the whole of Armitage fan world is wishing they were in your shoes last night!!!???? Even if they wouldn’t have had the courage to actually speak to him as you did!!!! Thank you for all your tweets too and well done for managing to conduct yourself with dignity!!! Once again, he sounds like a lovely person – the complete package! I’m glad he and all the other actors seem to have enjoyed the experience as much as the audience – I am still cursing myself that I didn’t go!!! If you could describe something more about his dancing, I would be even more happy – did he have any good moves???!!!! What a great story and so beautifully told! Certainly a night to remember! Thank you so much for posting this! It is wonderful to find out that he is the sweet guy that he has always seemed to be in interviews and such. You are very blessed to have gotten to meet him! Glad you had such a fantastic night, thank you for sharing with us RA fans who couldn’t be there. Thank you very much for this review and tweets last night Simone, they made our night. OOh, I couldn’t be more envious. How I’d love to have been there. I’m almost contemplating moving to London to be able to do these sort of things! Thanks for sharing this with us, you lucky, lucky woman! Thank you so very miuch for this report. You are the envy (in a good way) of RA’s huge fan base. What a magical evening and you will never forget it. I agree that he is stunningly handsome in person, as I got an autograph at the BAFTA’s this year. You actually sat next to him on a bus, I think I’d have melted. Welcome to our world. Float around all day!!! Thanks for sharing with us this wonderful once in a lifetime experience! Ok, I can’t decide what makes me more jealous, that you saw RA on stage (in a comedy, taking the mickey out of himself no less) or that you sat next to him on a bus for 15 minutes!! Thank you for sharing this wonderful experience with us. How wonderful. Congratulations to you for keeping your composure. I am SURE I would have sounded like a complete idiot the whole bus ride! Thank you so much for sharing this with us. We are all glad you have joined our ranks! Thank you so much for your wonderful review. Being a long time RA fan you confirmed what I have always, felt that he is a fantastic stage performer and a great person. I envy you getting to see him dance and do comedy on stage but it was fantastic of you to share this with us. Wow, thanks for such a fabulous account of a thoroughly enjoyable and unforgettable evening !! Thanks so much for sharing this. I’m amazed at both your courage and your self-restraint. Thanks for the detailed information, and also for demonstrating to Mr. Armitage that not all of his fans are the kind of women who send underwear. Did you bring your drool bucket? Was it Shiela that told you about RA? I’m so jealous, but at the same time I’m very happy that one of us had actually met HIM!!! Thanks so much for sharing your wonderful experience with Mr. Armitage. It’s nice to hear that he really is so gracious and down to earth. He is one class act! Thanks for spreading the happiness/excitement/goodness/pure bliss! Absolutely stunned and utterly happy for you! I wish I could see this performance… but how on earth could you restrain that, you’re a soldier! Lucky you! I must admit, I envy you for having seen RA on stage. I’d reallly love to see him in a play one day. The trouble is, I’m not based in London, not even in the UK for that matter. But had I known about this performance I’d have definitely come over for the show! So wonderful that he is as beautiful a man in person and was willing and grateful for your appraisal of his stage performance. I do hope he does more comedy, he definitely has a talent for it. OH. MY. GODS!!! Thank you so much for sharing your wonderful story – it must have been an incredible experience. Sounds like the stage show was a hoot! Really jealous now! Oh Simone, what a lovely story! You lucky lucky girl! He is just a slice of heaven isn’t he? It’s so lovely to hear what a genuinely beautiful man he is inside and out. And well done you for showing him respect. 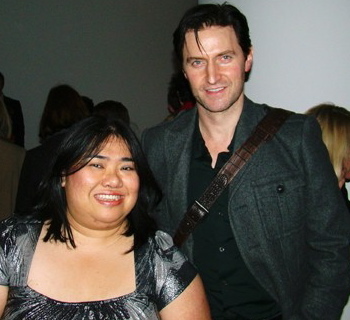 I’m just green with envy that you got to meet RA but so pleased that he’s so down-to-earth & gracious. I’m way too young to have a bucket list but seeing RA in the flesh will be at the top of said list when the time comes. That’s the Armitage Effect for you! What a lovely encounter … RA on stage … dancing & doing comedy!! What a treat to all his fans !!! Thank you for sharing. Just discovered him before X’mas 2010 in N&S. Bet his terrific in person and broodingly beautiful on the screen & stage, hence looking for his previous works and looking forward to his forthcoming roles. Is there a chance for a DVD of the stage play? For us who lives on the other side of the planet……..? Please advise if there would be one .. in your blog. Wow, this is a MUST-READ for fans of RA!!! Y’all know I like Richard Armitage (as if this blog does not make it obvious) but with all the new fan accounts and pictures, Simone’s account of seeing Richard in a play and then meeting him quite by accident ranks up there, if not at the top, for me. It’s an old account, but it’s my favorite. So do I wish that Richard gets to find a play that he likes in 2014? Heck yeah!